Nations have been glued to the television lately to watch the Summer Olympic Games- Rio 2016. We watch the superior skill that all of these super humans have to earn medals. Even though some go home without the bling around their neck, they are true heroes to even make it there to begin with. Their athleticism is top notch! For a moment we think, oh, if I only had that skill! Guess what? They were not born with it. They trained for it. They’ve earned it! We’ve heard so many inspiring stories of how the athletes have overcome many obstacles through their entire life to get to where they are today. Their roads have not been easy. Maybe that’s what gave them the encouragement to keep going. Their unfortunate circumstances fed their motivation and drive. Determination. And should we even start to talk about the hours they spend in training? They make it look so easy! You know why? It’s their passion. They have prepared their body (physically, mentally, and spiritually). They had a goal, and they worked for it. Imagine, if you will, a big map. Now mark where you are right now. Now, pick another spot on the map and mark it. Somewhere you want to go! So, how do you get there? You might have to take a few turns left and/or right to get out of your neighborhood. Maybe you will take a few highways or interstates. Or, maybe you’ll just take the back roads the entire time. Regardless, you map it out. You know where you are going and you figure out how to get there. Ok, so the trip will take days or weeks. That’s fine. Think of where your first stop will be. What about the next stop? You work your way to you goal, right? Break down the big trip into small day trips. On one particular trip back from the beach, we got held up on the interstate, almost to a complete stop. Right ahead of us was an exit. While everyone else just sat there on the hot asphalted 2-lane going north, I took the exit and found some back-roads. I rolled down the windows to enjoy the breeze, all while the tunes of Journey blared through the speakers. Did I get upset? Nope! I did, however, wonder why all of those other people just sat there in the stalled traffic. Were they scared to venture out? We will have bumps in the road on our journey to reach our goals. We have to be willing to overcome them. We have to keep our eye on the prize, if that’s what we REALLY want! Is your goal big enough to make you keep training and pushing through? So, you really want it, right? Get busy training. Figure out those small steps that will get you from HERE to THERE. It doesn’t have to be all in one day. Break it down. What are the individual things that you can do to help you get to the big pictured prize? There’s no jumping from the starting line directly across the finish line. It doesn’t work that way. 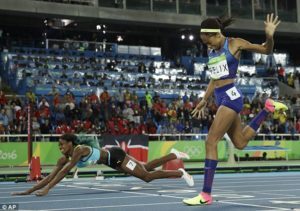 However, in the Olympics, we did see a few that did a nose dive over the finish line. Yea, it wasn’t planned and I bet they were in pain the next day. Not recommended. otherwise you'll be dead before you can enjoy them at the finish line! Now go and enjoy your journey! It’s just as important as the goal itself! Oh, and before you can start the trip, you need to get off of the couch, out of your house, and into the car. What are you waiting on?